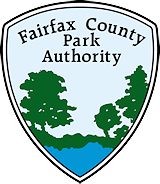 A lot of Fairfax County Park Authority programs are look-and-touch programs, but there are times that the no-touch guideline is critical. There’s a new wayside information sign at Ellanor C. Lawrence Park (ECLP) with information on it about salamanders and frogs. The sign, along the south side of the gas line that runs through the north end of the park, includes life-size photos of salamanders and frogs and QR codes that link to frog calls. ECLP has been working closely with the Virginia Herpetological Society (VHS) to design and install the sign, which also has information about the best ways to interact with vernal pools and to protect those pools. So, what’s a vernal pool, and what do they have to do with signs about frogs and salamanders and the no-touch guideline? Vernal pools are temporary puddles and ponds of water that are large in the spring and dry later in the year. When the water is there, they teem with life. Spotted salamanders, wood frogs, American and fowler toads breed in them. There are also small insects – dragonfly larvae, water bugs, fairy shrimp and plants. Because there’s so much going on in these pools, protection of them is part of good natural resource stewardship. That’s the “look” part of “look but don’t touch.” Everything is working as it should. “Many people think they are doing a good thing by catching tadpoles and relocating them,” Bulmer said. “They are afraid the pool is going to dry up. But relocating them can hurt the tadpoles, especially if they are relocated to an area that has fish.” This has been an issue in large parks like Burke Lake and unstaffed parks, where people have removed tadpoles and salamanders and taken them home. Remember, removing anything from a park violates park rules and can impact the park’s natural resources. Bulmer says people sometimes move tadpoles to deeper water that may have pollution that the human eye cannot detect. That’s why he suggests sitting quietly and watching the magic of the vernal pools. If that desire to help is overwhelming, volunteer to be an egg mass counter or sign up for park programs about amphibians. Habitats like vernal pools are avenues to learning about amphibians living in our forests. So are signs like the one at ECLP that grew out of the partnership between VHS and the Park Authority. It’s a terrific partnership, and VHS is an information source for FCPA employees on the front lines of stewardship in the parks. The VHS website can be a go-to place for information about reptiles and amphibians. There’s more information online about Ellanor C. Lawrence Park and the Virginia Herpetological Society, and the Park Authority has a video on the Hidden Pond web page about frogs and their calls. This entry was posted in Uncategorized and tagged Ellanor C. Lawrence Park, Fairfax County Park Authority, vernal pools, Virginia Herpetological Society on May 13, 2015 by Fairfax County Park Authority.